Making folders on your iPhone is a terrific way to reduce clutter on your home screen. Grouping apps together can also make it easier to use your phone — if all of your music apps are in the same place, you won’t have to go hunting through folders or searching your phone when you want to use them. How you create folders isn’t immediately obvious, but once you learn the trick, it’s very simple. Follow these steps to create folders on your iPhone. When you’ve added all the apps you want and edited the name, click theHome button on the front center of the iPhone and your changes will be saved (just like when re-arranging icons). When you first create a folder, the iPhone assigns a suggested name to it. That name is chosen based on the category that the apps in the folder come from. 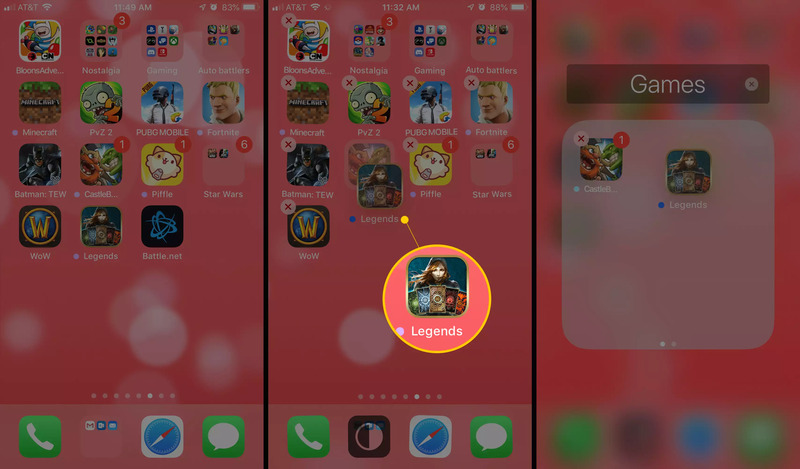 If, for instance, the apps come from the Games category of the App Store, the suggested name of the folder is Games. You can use the suggested name or add your own using the instructions in step 5 above. Move one of the apps currently in the dock out by dragging it to the main area of the home screen. Drag a folder into the empty space. Press the Home button to save the change. Making folders on the iPhone 6S and 7 series, as well as the iPhone 8 and iPhone X, is a little trickier. That’s because the 3D Touch screen on those devices responds differently to different presses on the screen. If you have one of those phones, don’t press too hard in step 2 above or it won’t work. Just a light tap and hold is enough. Drag the app out of the folder and onto the Homescreen. Simply drag all the apps out of the folder and onto the Homescreen.